Here are some dinner plates with incised birds. These will get some brushwork which may or may not obscure the birds. 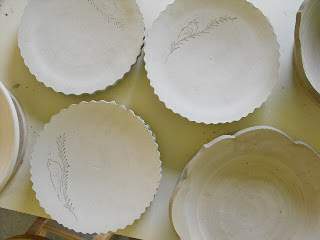 Since these are dinner plates I may do a white slip, then a regular wax resist pattern, then another layer of the crackle slip. It will be subtle and nice, I hope. I will handle the jugs and throw pitchers this afternoon.